Double shot for the presentation 2015 and Aprilia with the RF RSV4 Tuono V4 1100 RR. The sports ultra roadster of Noale evolves significantly: displacement, power and torque on the rise, more relaxed ergonomics, reworked… suspensions what make a roadster of everyday life? Not sure, but this short grip we have at least allowed a glimpse of its potential… always high. 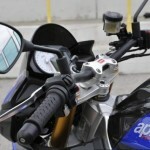 We start from the Misano circuit to the handlebar of the new Aprilia Tuono V4 1100 RR. With two tries to close during the day, do not lose time, and we will later learn it at our expense. 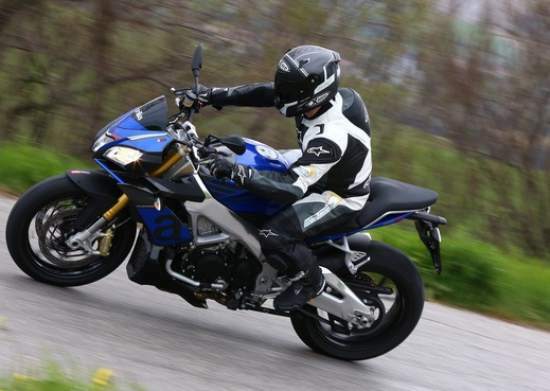 The grip of the Tuono 2015 is a very good surprise. The new handlebars, narrow and secluded, promotes means templates. And the saddle has swapped his padded solid oak (one of the shortcomings of the previous generation) against an otherwise more comfortable foam. It is actually the day and the night facing the previous model that we also had on hand. Certainly, the general mood and the ergonomics remain resolutely sports, with a high seat which, with 825 mm, loses 10 mm and always folded legs. The gearbox is quite catchy, the clutch a bit firm and its lever non adjustable too distant for little hands. Announced to 184 kg dry, the Tuono 1100 RR is a lightweight roadster, but still very stiff and sporty geometry. Thus, it is lead virtually never: she asked to be driven! His handlebars, it should be remain determined, with movements francs, but not unnecessarily brutal, otherwise she is rebellious to the placement. In town and the round points, be trajecter carefully on the momentum as the Tuono braque very evil. However, the grip is easier than before and regular users will appreciate progress toward approval. In addition to a saddle that will invite you to drive more than 50 km without the cursing, the another good surprise comes from suspensions. 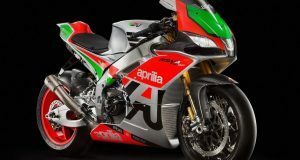 The previous evening, the speeches by the Aprilia staff press conference had surprised more than one. 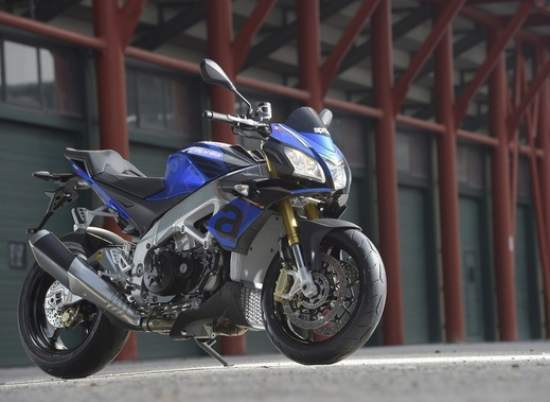 Hear them, the Tuono was become a motorcycle every day. This is of course not the case. Nevertheless, new suspension settings really improve damping on gradient coating. And believe me on Word, the roads in the vicinity of Misano are frankly damaged and slippery. 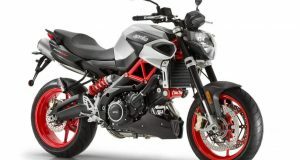 Let’s go back to our sheep: without becoming a marshmallow waving on its suspension, the Aprilia roadster digests much better the holes. Despite some passages in potholes, it will not compacted me vertebrae. A true progress! 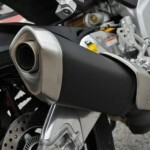 Always a thunder on the Tuono engine! But a Tuono, it is above all sensations pickling liquors. And the new version of the V4 is not lacking in Chili! Use, the mechanical base immediately, but with now 1 077 cm3 available torque at midrange is more copious. Starting at 4 500 rpm, it pulls super fort on the arm in the melodious roar of the V4. The already sensational extension still increased, while the power increased by 8 c.
Result between 7 500 rpm and 10 500 rpm, it grows like a dragster if it manipulates the way accelerator on / off. 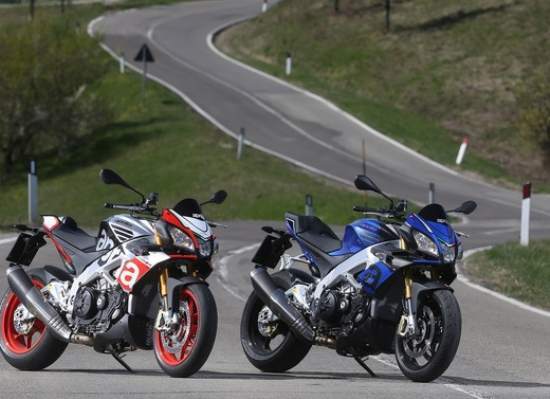 The low sides become quickly blurred and there is no doubt that the Tuono is always among the sports roadsters best-performing market. On Italian winding roads, it is almost impossible to put the accelerator stops. And anyway, the Polizia standby. 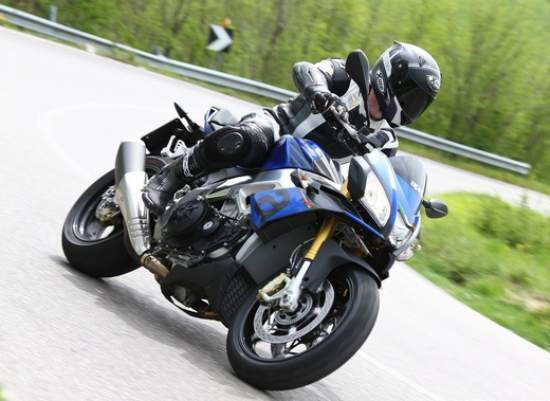 At least, the Aprilia Tuono 1100 is only communicative, and when we drive fast, you know. Not like on some motorcycles also swift but more discreet. Efficient block enjoys therefore a filling up at midrange, with times guns. However, it displays a flexibility of V4, requiring to knit the left foot more than with a four-cylinder in line. In the city, for example, do not expect to exceed the third report. But play the selector, especially with the shifter that compensates for the dryness of the selection, also part of the pleasure that offers this boundless vitality mechanics. 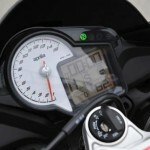 Strangely, while Aprilia wanted to make it the most versatile Tuono, it was decided to replace the Rain mode (at the less power) by a Race mode that would be most usable on circuit through a mapping optimizing the roundness. In addition, now all maps display the same power, 175 horses in free version. These choices appear somewhat strange, but the determination of the throttle grip turns finally always succeeded, excluding jerks sometimes linked to a ride by wire incorrectly sized or very poor adjustments. The difference of the mappings now feels on the response to the handle and the determination of the motor brake. Between the municipal Polizia interlude and totally random adhesion of roads, it is clear that we will not be able to maximize the Tuono during this test a little frustrating. The part-cycle will still unveiled its general accuracy, his excellent handling of cap and its rigour in big curve. 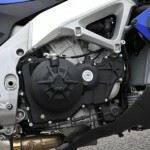 Braking is in unison, and big Brembo slabs have no harm to slow a bike of this template. 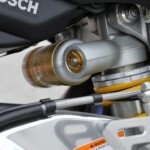 However, Aprilia could have replaced the master cylinder of axial front brake by an element of better: felt the lever in would have been better. 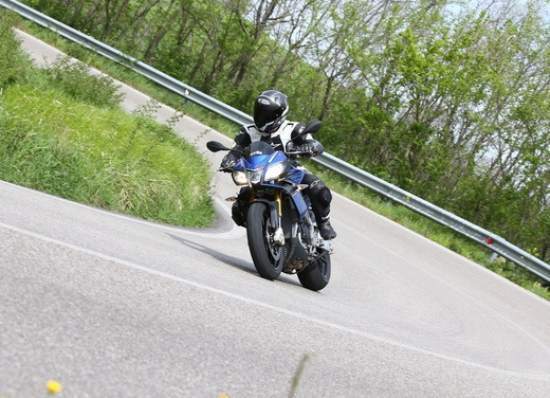 You can also see a slight tendency to stiffen when braking in curves, but the Tuono remains controllable in all circumstances. What is holding the wire miles and attempts to identify the behavior, it is that the Tuono is in need of an enabling environment to provide the best of it even. On a rutted road, it makes want to lower rate because its rigidity is communicative despite the depreciation in progress. If you cross a bottled village, engine thermometer quickly 100 ° C and the heat not long before cook you the thighs. Despite the work done, and brings the 2015 maturity, the Aprilia Tuono remains an extreme roadster which becomes formidable efficiency as soon as the conditions are met: impeccable winding road, good grain of bitumen or circuit not too skimpy to make talk powder. At least, with increased comfort, time spent on the road to join the circuit will seem you less painful. Even more comfortable saddle and suspensions, and more protective with his new nose fairing, the Aprilia Tuono V4 1100 RR remains extreme in its kind. 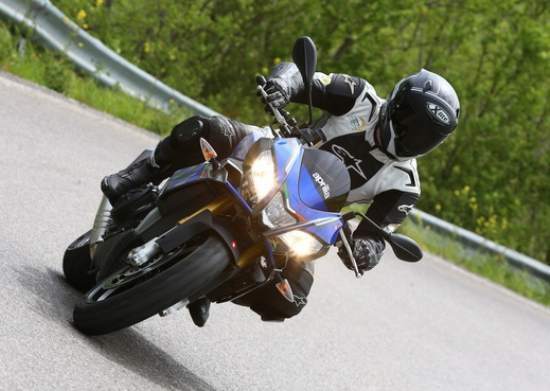 Versatility rises significantly, but it undoubtedly remains a recreational motorcycle for use in sports come weekend. Impressive performance, it is intended for experienced enthusiasts, only able to appreciate the full qualities of one of more hot sports roadsters of the market. Its natural rivals are called 1290 KTM Super Duke R ouBMW S 1000 R, two naked as effective on route than on circuit. Sold €14 650 in version RR already fully equipped side embedded electronics, she climbs to €16 949 in version Factory with Öhlins suspension. Given the gear technology and performance, these prices seem justified, even if the latest 2014 models displayed at a competitive price of €13 999.